Conventional surgery such as the classic face lift addresses skin laxity and wrinkles. However, major factors in aging are the generalized volume loss of subcutaneous tissues in the face, as well as bone loss from the skull itself. This combined volume loss contributes to skin laxity, wrinkles, and hollowing. In many patients, restoring lost volume with a Liquid Facelift accomplishes significant rejuvenation without the downtime of surgery. A Rejuvent Liquid Face Lift can help you regain your youthful look by restoring the curves of youth! When choosing to proceed with a Liquid Facelift that involves filler injections in areas such as under the eyes, the brows, the glabella, temples, the nose, cheeks, chin, forehead and along the jawline, it is critical to choose an expert injector. Drs. Bomer and Bouzoukis are experts in full face rejuvenation with dermal filler and neuromodulators. Their training as Facial Surgeons combined with their passion for injectables enables their patients to safely reverse the signs of facial aging. With age, volume is lost throughout the face, jaw, and skull; to successfully restore the curves of youth the Rejuvent doctors utilize their artistry, experience, skill, and judgment, to address all areas losing volume (both bone and fat loss) and help their patients achieve a more natural transformation. The judgment of the provider plays a large role in the outcome of a Liquid Facelift, for example, some providers limit filler to nasolabial folds and cheeks which often leads to an unbalanced look. Doctor Bomer and Dr. Bouzoukis do not look at wrinkles and sagging skin in isolation and instead consider how volume loss in one area affects others. Experience matters! At Rejuvent, over 10,000 patients have undergone facial injections since 2004. Dr. Bomer is a Liquid Facelift pioneer and has developed and mastered her own injection technique to reverse age-related volume loss and tissue drooping with minimal to no downtime, she has trained Dr. Bouzoukis and other physicians on her unique advanced injection technique. For any additional questions, or to schedule your complimentary consultation for Liquid Facelift and Full Face Rejuvenation in Scottsdale with Dr. Bomer or Dr. Bouzoukis, call Rejuvent at 480.889.8880. Rejuvent is located in Scottsdale, Arizona and conveniently located near Paradise Valley, Tempe, Mesa and other areas of Greater Phoenix. “I had been using fillers on and off for a few years before coming to Rejuvent and the difference between Dr. Bomer and other “Injection Specialists” is quite noticeable. 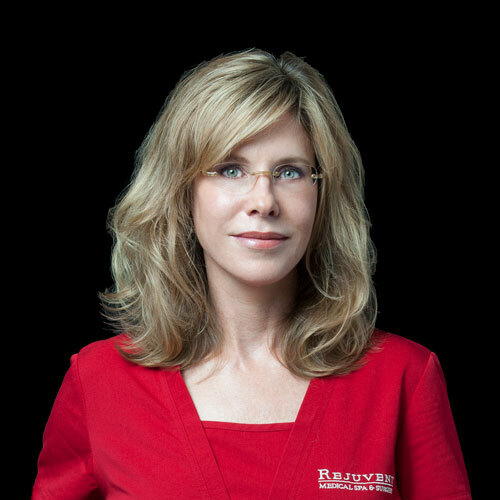 First is the fact that Dr. Bomer does all the injections herself and does not delegate to a mid-level practitioner. She takes the time, every time, to study your face to see where and which product is needed… even if it’s only a little Botox. Her willingness to share knowledge of the face and how these products work usually answers my questions before I have to ask and when I do she answers them thoroughly. 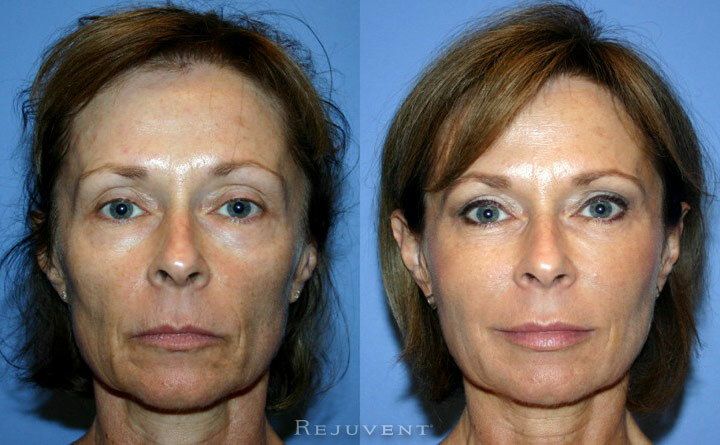 Visit Rejuvent for a complimentary consultation and find out how Dr. Bomer and Dr. Bouzoukis’ approach to Liquid Facelift can help you achieve the full face rejuvenation, and facial harmony you are looking for. These before and after photos are a small sampling of the amazing results Dr. Bomer & Dr. Bouzoukis achieve for their patients in their Scottsdale location. What to Expect During a Rejuvent Liquid Facelift? During a Liquid Facelift, Dr. Bomer and Dr. Bouzoukis inject Botox, Dysport, and dermal fillers such as Voluma, Restylane Lyft, Refyne and Defyne, Radiesse, and Juvéderm to contour, enhance and restore volume. Their attention to detail in facial analysis coupled with their aesthetic eye and technical skill yield optimal results for their patients. Patients are accustomed to planning months in advance for surgery – but aren’t used to thinking that far ahead for injectables. As a team, we work to educate patients on reversing aging and maintaining rejuvenation – it’s not a 20-minute injection and you’re out the door. A new patient visit can last 2-4 hours and the Liquid Face Lift appointment for 2-3 hours. Time is spent on photography, analysis, and education. The amount of preparation and execution involved in a Liquid Facelift is comparable to a minor surgery. As Facial Plastic Surgeons, Drs. Bomer and Bouzoukis have unparalleled knowledge of the anatomy beneath the skin that non-surgeon providers do not have. They also perform all Liquid Face Lifts themselves. Many surgeons focus only on surgery and delegate injections to their staff. Dr. Bomer and Dr. Bouzoukis are renowned for their skilled and artistic techniques in creating a natural, refreshed look. Their patients come from all over the world to seek their natural results. Dr. Bomer and Dr. Bouzoukis use the Artiste Injection System to enhance their already superior technique for filler injections perfected at and unique to Rejuvent. We are the only office in Arizona using this technology! The Artiste Injection System allows the filler to be injected at a constant rate with a steady flow of filler which is beneficial for creating smooth and even contours without lumps. This technique grants greater control, precision, and a level of accuracy that cannot be achieved with traditional injection methods. Visualization – Dr. Bomer and Dr. Bouzoukis use state-of-the-art computer imaging to analyze each patient’s face and determine the areas that need lifting and volume restoration as the first step. They rejuvenate the patient with computer modeling first, to ensure the best outcome. Photographic analysis with computer modeling is accepted as a standard for certain surgical planning, yet most injectors do not put an emphasis on pre-planning for injections. Vectors – The fillers used for lifting the face are placed along specific vectors in the face that maximize the lift of tissue. There is also a specific order regarding which areas are filled in sequence to maximize volumizing and lift while maintaining a natural result. Volume – To provide the best result, an appropriate amount of fillers must be used to restore volume loss. Underfilling is a common reason for suboptimal results. Overfilling in only one or two areas such as the mouth and lips also leads to an unbalanced look. Dr. Bomer and Dr. Bouzoukis often combine several different fillers such as Voluma, Radiesse, Restylane, and Juvéderm throughout the face to reverse aging while maintaining a natural look. The different fillers vary from each other in density, viscosity, and longevity, which makes them optimal for use in specific facial regions. Depending upon the correction required, 4- 9 syringes of filler and 2-6 units of neuromodulators may be used during a Liquid Facelift. We Are True Liquid Facelift Experts! Call Rejuvent Scottsdale at 480-889-880 and schedule your complimentary appointment today! Frequently asked questions related to Liquid Facelift at Rejuvent. A Liquid Facelift is a non-surgical procedure that uses dermal fillers and wrinkle relaxers such as Botox to rejuvenate the face and restore volume lost due to aging. 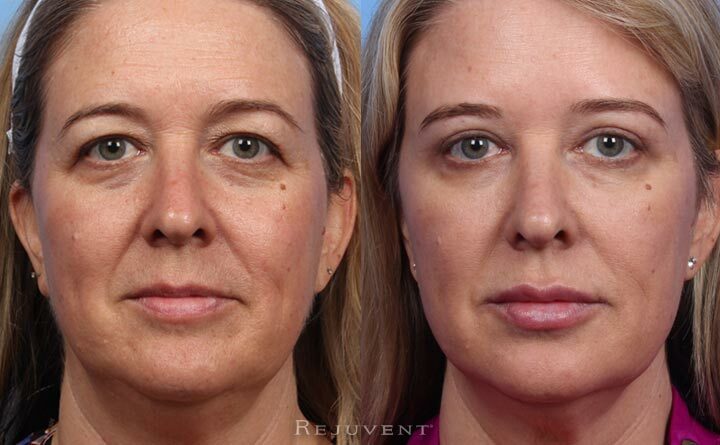 Unlike other practices, a Liquid Facelift at Rejuvent is approached with the same care and diligence as a surgical solution and there is a lot of planning involved with a Liquid Facelift. After the entire face is photographed and analyzed by the doctor, a course of action is presented to the patient and the procedure begins. Read more about what happens to your face as you age and see why these changes are happening to your face. Why are Liquid Facelifts so popular? In the hands of the right doctor, Liquid Facelifts can produce natural-looking results that enhance your face, rejuvenate and restore lost volume. As we age we lose volume in our face, we lose fat volume and bone volume, this occurs because of the fat pads and bone mass shrink. This fat and bone loss causes the structure of the skin to lose its support, which then becomes lax and wrinkly, the loss of volume also creates hollows and depressions under the eyes, temples, cheeks, nose, and throughout the face. In a traditional Facelift, the skin is stretched and repositioned to address the volume loss, the stretched skin hides the volume loss but does not replace it. In a Liquid Facelift, volumizers are injected in different depths under the skin, or directly in the bone to provide the volume from within, these dermal fillers can reshape lips, plump under eyes, enhance the cheeks, augment the chin, fill deep wrinkles, enhance the nose, fill the lost volume in the temples and throughout the face. Along with the dermal fillers, neuromodulators and wrinkle relaxers such as Botox are injected to address certain wrinkles. How long is the appointment for a Liquid Facelift ? On average, a Liquid Facelift appointment will last for 2-3 hours. Unlike other practices, we do not advocate a one-hour Liquid Facelift. Why? Because all faces are different and a cookie cutter approach for Liquid Facelifts does not achieve natural results. All products injected are prepared specifically for that patient, we do customize our fillers and prepare a custom plan of action for each patient. At Rejuvent, we will take the necessary time to ensure that the patient receives the correct amount of filler necessary to achieve the best rejuvenation possible. We take measurements to manage pain and make the Liquid Facelift experience as comfortable as possible. Why should I get a Liquid Facelift at Rejuvent? Dr. Bomer is an expert in full facial rejuvenation and has refined the Liquid Facelift to reverse age-related volume loss and tissue drooping with minimal to no downtime, she has trained Dr. Bouzoukis and other physicians on her advanced injection technique. 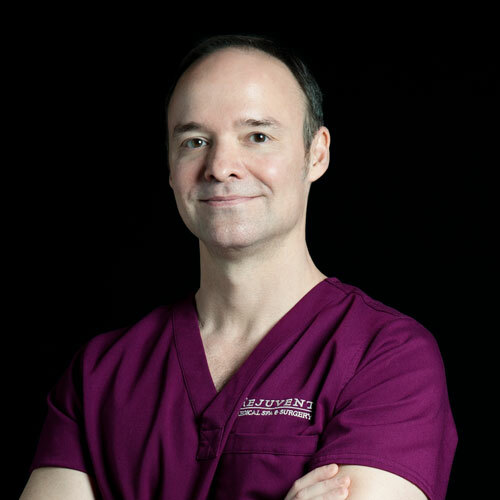 At Rejuvent, both Dr. Bomer and Dr. Bouzoukis are facial plastic surgeons and specialize in facial rejuvenation, they are board certified and facial anatomy experts. Their knowledge and experience in the facial vasculature, nerve mappings, and facial vectors guide them in achieving results other providers cannot achieve. How long before I see my Liquid Facelift results? You will look your best at 3 to 4 weeks post-injection. Do NOT to have an important social event for 10 days after filler because you might have some bruising or swelling. How can I prepare for my Liquid Facelift? We recommend that our patients follow these steps before their appointment for Liquid Face Lift. Do not take any aspirin, ibuprofen or similar products (Advil, Motrin, Aleve) for 1 week prior to filler. Avoid fish oil, Vitamin E, and gingko biloba for 1 week prior to filler. Eat spinach, kale and celery the week before to boost your levels of Vitamin K.
Avoid eating apples or large quantities of garlic before your appointment. Hydrate and eat a large meal before filler and bring a snack to eat right before the injection. It is important to have a full meal before a filler appointment. As the Doctors are performing multiple liquid facelifts per day as well as surgeries, there are times that appointments run over their scheduled time. The doctors are committed to you and will stay as long as is required to give you the very best result. It is helpful for you to bring a snack if there is a waiting period longer than expected. Be prepared to wash your face thoroughly at Rejuvent. At the end of the filler injection, sunscreen and liquid foundation (if appropriate) will be applied. If you would like additional makeup after filler, we suggest you bring some with you. Let us know in advance if you are on a prescription blood thinner. Read more about preparing for your injections appointment. How can I minimize bruising and swelling and speed up healing? How can I maintain my Liquid Facelift? Stay hydrated – hyaluronic acid (Restylane, Juvéderm, Voluma) binds to water, the more hydrated you are the better you will look. It is best not to go more than 6 months between filler appointments. By maintaining this schedule you will not only be able to maintain your look, but also make continued improvements (when an adequate amount of filler are placed). After two years of this type of schedule, the majority of patients will require less filler per visit than during the first two years. I have been committed to natural healthy enhancements for the face for over 20 years and look forward to meeting with you.